Bring extraordinary flair to your next event by booking someone truly unique. Your guests will be amazed when you have fire breathers, jugglers, stilt walkers and other unusual entertainers at your event. Use KidsParties.Party to find astonishing and unexpected performers for your event in Middlesex County, Massachusetts. Not sure of the type of entertainment to book? Scroll below for six unique suggestions. 1. Fire performers: A custom that hails from the Islands of Polynesia, a fire dancing demonstration will ignite your party. 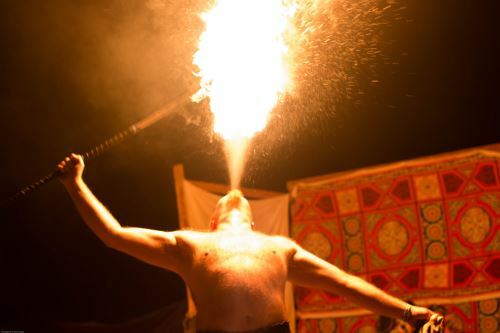 Not only will these entertainers put on a performance, many have also mastered the skill of fire breathing. 2. Sword swallowing: The art of sword swallowing originated in India in 2000 B.C.E. Today, performers continue to master the techniques and skills necessary to swallow swords. An insider tip: the trick of sword swallowing is to not actually swallow. Cotnrarry to the name, sword swallowers are adept at relaxing all 50 muscles in the esophagus. This is a party trick that we’ll leave to the professionals. 3. Hypnotists: If you've never been to a hypnotist show, you don’t know what you’re missing. If you are a member of the audience, watch in amazement as the hypnotist selects volunteers to become part of the show. Would you ever volunteer to be hypnotized? 4. Hula hoopers: We typically think of hula hooping as a childhood playground game, but there are performers out there who can do amazing hoop dances and tricks. Many hoop performers also host interactive workshops for children’s parties, where guests will decorate their own hula hoop and learn some basic tricks. 5. Cirque troupes: Bring the excitement of the circus to your next event. If you are hosting and over-the-top special occasion, booking an acrobat, aerialist, stilt walker, or juggler will provide entertainment for your guests. 6. Silent parties: What is a silent party? A fairly new concept, silent parties consist of a DJ entertainer who provides your guest with noise-cancelling headphones. The DJ will then play tunes like a regular DJ, but the only people can hear it are the ones with the headphones. Interested in having something like the performers listed above at your party or event in Middlesex County, Massachusetts? Use KidsParties.Party to find the most unusual and imaginative entertainment in your area. Want to make your party even more unique? Try sending out 100% unique party invitations! Our custom invite making feature allows you to design and create just the way you would like! Use one of our pre-designed themes, or start with a blank template for something completely one-of-a-kind. We would love to get you listed right away! Create an account to get started.